In mid-January 1809, the situation of the British Army in the Iberian Peninsula was grim. Moore's army had been forced to evacuate Coruna after a disastrous retreat and to return to England. In Portugal there remained fewer than 14,000 men under General Cradock. French forces were threatening from several directions. For many the only viable option was to evacuate Cradock's troops and to cut the British losses. Yet those orders never came. Instead Cradock began to organize the remaining troops for the defense of Portugal. "I have collected several detachments of recovered men belonging to sir J. Moore's army, whom I found scattered in all directions, without necessaries, and some of them committing every possible excess that could render the name of a British soldier odious to the nation." Men continued to be assigned to the battalions up until late summer 1809. These men were described as "escaped from the French" or "from the frontiers." The 1st Battalion had men join from the 14th, 35th, 59th, 76th, and 81st Regiments, while the 2nd Battalion picked up soldiers from the 1st, 9th, 23rd, 26th, 59th, and the Staff Corps! By the beginning of May, the 1st Battalion was commanded by Lieutenant Colonel William H. Bunbury of the 3rd Foot. Its exact organization is unknown, however the 2/43rd Light Infantry, the 52nd Light Infantry, the 92nd Highlanders, and the 95th Rifles formed separate companies. The 2nd Battalion was commanded by Lieutenant Colonel Edward Copeson of the 5th Foot, and it too had enough men from different regiments to form them into separate companies. The soldiers from the 82nd Foot were in a company commanded by Captain Carew. On 22 April 1809, Sir Arthur Wellesley (the future Duke of Wellington) arrived in Lisbon with an additional 8,300 men to bring the British forces there to almost 29,000 men. He decided to attack the French forces under Marshal Soult who had captured Oporto in late March. The 1st Battalion of Detachments was brigaded with the 29th Foot and the 1/16th Portuguese Infantry under the command of General Richard Stewart, while the 2nd Battalion of Detachments was brigaded with the 97th Foot and the 2/16th Portuguese Infantry under General John Sontag. In early May, he began moving the army northward. 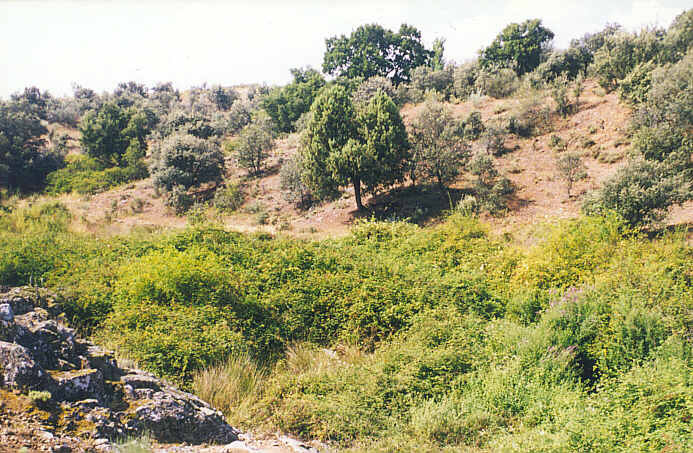 In The History of the Rifle Brigade, Willoughby Verner describes how the 1st Battalion of Detachments had its first taste of combat on 10 and 11 May near the village of Grijo. "The infantry of the advance guard consisted of the Rifle Company of the 1st Battalion of Detachments, the Companies of the 43rd and 52nd Light Infantry and the Light Company of the 29th Foot, the whole under the command of Major Way of the 29th. [Stapleton] Cotton with the British Cavalry came in touch with the French at dawn on the 10th, but [General] Francheschi had some infantry with him and Stewart's Brigade was delayed and did not come for some time; Francheschi thereupon fell back and joined [General] Mermet at Grijo. On the 11th Wellesley ordered [General Rowland] Hill to endeavour to outflank Mermet's position on the east whilst he with Paget's Division advanced. In the afternoon the Light Companies of the 1st Battalion od Detachments attacked Mermet but met with a stiff resistance and lost not a few. Wellesley now ordered the King's German Legion to turn the French left and the 16th Portuguese to turn their right and with the rest of Stewart's Brigade renewed the attack on the wooded heights in the centre above the village of Grijo. Mermet thereupon withdrew..."
The Commander of the Forces congratulates the troops upon the success which has attended their operations for the last four days, upon which they have traversed above eighty miles of a most difficult country, in which they have carried some formidable positions, have beaten the enemy repeatedly, and have ended by forcing the passage of the Douro, and defending the position they had so boldly taken up, with numbers far inferior to those with which they were attacked. In course of this short expedition the Commander of the Forces has had repeated opportunities of witnessing and applauding the gallantry of the officers and the troops, the activity and conduct of the 95th, and of the Light Infantry of the 29th the 43rd and 52nd." Daniel Nicol goes on to write that in late May, the Battalion had begun to move again ". . . over the bridge of boats across the broad and rapid Douro and bade adieu to Oporto forever, with its churches, convents, and port wine. To the last the British troops paid more devotion than to the first." On 4 June they celebrated the King's birthday with each man receiving a pint of wine and a chance to bathe in the Mondego River. ". . . in Portugal we had experienced the most distressing cold and wet weather; it was now as suddenly as intensely hot, and we had very little except the olive-trees, which we were prohibited from cutting, to screen us from the scorching rays of a sun almost vertical. This being an open corn country, we were the whole day exposed to its beams, and the ground was so exceedingly warm, that it produced the greatest number of insects I ever saw. We were infested and annoyed, beyond measure, by the scorpions and centipedes crawling over us, and the mosquitoes stinging us in such a manner, that I have frequently seen officers and men with their eyes so swollen that they could not see out of them for some hours. . . our advance continued, and the weather retained its sultry heat. Many a weary step, over many a dreary league, we dragged through the dusty way; sometimes not seeing a house for days together, sometimes without a drop of water to wet the parched and swollen tongue of the way-dropped solder -- for there were many who sunk under the oppression of this excessive heat. We had frequently no fuel, not even a shrub that would serve as a piquet for the baggage-horse; and occasionally no forage was to be had for these poor animals after their hard day's labour, in which case they had to move till they came to a more verdan spot. However, as our commissariat had hitherto precured us plentiful, and we received our rations very regularly, we were enabled to continue our exertions till we arrived at Talavera de la Reyna." Wellington chose to fight the French forces under Marshal Victor, just north of the city of Talavera. The right flank of the position was secured by the Tagus River and the city itself. North of the city, the position was fairly flat for about two kilometers. There the Cerro de Medellin rose out of the earth. This massive ridgeline towers 200 feet above the plains. The slopes on all sides is fairly steep, but steepest on the eastern side -- the side that faced the French. North of the Cerro de Medellin was another broad plain. To the east, separating the two armies, was the La Portina creek which was a shallow trickle of stagnant water in a 10 meter deep gully. "Our officer cried out 'Don't fire on the Spaniards.' I and many others jumped to the side to let them pass down the hill, where they were either killed or taken prisoners in our rear. I saw those on the top of the hill by the flashes of their pieces; then we knew who they were; but I and many more of our company were actually in rear of the French for a few moments, and did not know it until they seized some of our men by the collar and were dragging them away prisoners. This opened our eyes, and bayonets and the butts of our firelocks were used with great dexterity -- a dreadful melee." "Order was restored, and a deathlike silence reigned among us. The French kindled great fires in rear of their lines. I had a sound sleep for a short time. . . When daylight appeared each army gazed on the other and viewed the operations of last night. Round the top of the hill many a red coat lay dead; about thirty yards on the other side the red and blue lay mixed, and a few yards farther, and down in the valley below, they were all blue." ". . . General Stewart's brigade was ordered to advance to the top of the hollow, when all the others were ordered to lie close to the ground, as the French had taken up a position with their heads above the rise, and were doing much mischief. We sustained a heavy fire from the enemy's guns on the other side of the hill; they were making lanes through us, and their musketry attacked us on our flanks. We cleared the enemy from our front and right, but they maintained the heights on the other side; and as were lower than they, they punished us severely. . . Captain MacPherson of the 35th Regiment, who commanded our company this day, was down and my right file was taken off by a cannon-shot. William Bowie and John Shewan were killed on my left, and Adam Much lay in the rear wounded." "About four o'clock I was struck by a musket ball, which grazed my left knee and passed through my right leg about two inches below the cap of the knee. I finished my loading and fired my last shot at the man who wounded me, for I could plainly see him on a height a few yards to my front. I think I should have known him if he had come in my way afterwards. I called out to Sergeant John Gordon that I was wounded; he was the only non-commissioned officer belonging to the regiment I saw at his post. I made along the side of the hill as well as I could, using my firelock as a crutch." This attack ended the 1st Battalion's involvement. In the two days of the fight, they suffered over 250 casualties, over 200 of them on the second day. Total casualties were: 1 officer and 40 men killed; 9 officers and 206 men wounded; 2 officers and 16 men missing. Officer casualties included Major Ross, the battalion's senior major, and Lieutenant George Brown of the 43rd Regiment, who would go on to command the Light Division in the Crimean War. Oman states that one of the officers was not captured but "turned up at Oropesa next morning, nominally sick." The 2nd Battalion of Detachments were part of General James Kemmis' Brigade (1/40th Foot, 97th Foot, and the 2nd Battalion of Detachments) which was on the far right of the British line. The 2nd Battalion was on the right of the brigade and was thus on the extreme right of the whole British Army. On their right were the Spanish. The Battalion saw little action during the battle and lost 7 men killed, 13 wounded, and 1 missing. On the night of 28 July, Lieutenant Wood and 20 men were sent down to the La Portina to gather up any wounded (both British and French) and protect the wounded French from the Spanish. "I had only gone about one hundred yards, when one of my men, who were scattered for the purpose, called out for me to go to him, and told me that a Spaniard, whom he pointed out, was about to shoot a Frenchman, badly wounded; who was crying most piteously. 'Mon Dieu! Mon Dieu!' I waited to see what were really the Spaniard's intentions: he deliberately loaded his piece, and was going to present it at this unfortunate creature, when I arrested his arm, and sent him away; but on looking behind me, I observed him creeping through the vineyard to return and accomplish the diabolical and cowardly act of killing a fallen enemy in cool blood! On seeing this I ordered my men to take the wounded man and remove him from the spot where he was, to some shady olive-trees, with which this plain was planted; and there I formed a kind of depot for these poor suffering wretches, with a guard to protect them till the carts came to take them away." 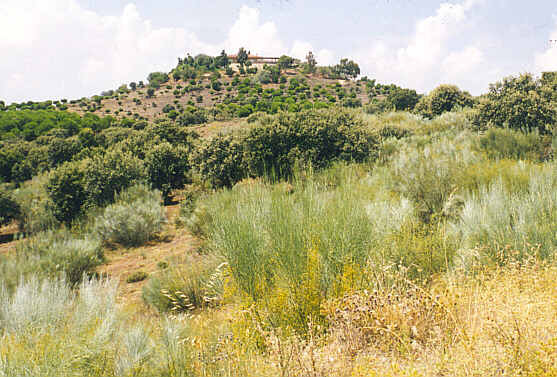 Despite their gallant service at Talavera, the battle was the beginning of the end for the Battalions of Detachments. On 29 July, the day after the battle, the Light Brigade arrived after making a force march of 42 miles in 26 hours. The men who belonged to the Rifle Company of the 1st Battalion of Detachments immediately joined their fellow riflemen in the 1st Battalion 95th Rifles, while the officers and soldiers of the 43rd and 52nd Light Infantry joined their regiments -- although this was not made official until a General Order on 14 September 1809 sent them and the soldiers from the 5th, 42nd, and 28th Regiments to battalions from their regiments serving in the Peninsula. ". . . each detachment proceeding to join its respective regiment. I marched with mine to Lewes, in Sussex; and on our arrival we certainly cut a very ludicrous appearance, from our ragged state, but were received with a hearty welcome by our long-lost comrades. . . "
"The Commander of the Forces cannot avoid to express his regret upon losing the services of the two battalions of detachments, which are about to join their corps in England. . . He requests Lieutenant Colonel Banbury(sic), Lieutenant Colonel Copson and the Officers attached to these battalions, to accept his acknowledgement for the attention they have given to them." "I wish these detachment battalions were replaced. I am sure they are the cause of great disorder -- no esprit de corps for their interior economy among them, though they will all fight. They are careless of all else, and the officers do not look to their temporary field-officers and superiors under whom they are placed, as in an established regiment. I see much of their indiscipline." It should be noted that Wellington in his general order also mentioned that he had to remind them of proper conduct and when they returned to their parent units, the men were to ensure they behaved properly. 1. The battalions were composed mostly of the men who previously wounded or too sick to campaign or men who became separated from their parent units during the horrendous retreat to Coruna. In the latter case they were stragglers. Stragglers as a group tended to be poorly disciplined or in poor health -- a combination that would effect any unit. The two campaigns took a heavy toll on the Battalions and the last return for the two battalions showed the 1st Battalion of Detachments had 496 men listed as being "sick" and only 359 present for duty. The 2nd Battalion was marginally better with 388 "sick" and 514 effectives. On a side note, many of those wounded at Talavera, were left in a makeshift hospital at Talavera and were captured by the French, including Daniel Nicol. 2. The heart of the British Army was the regiment. This system was based on tradition and pride. Yet the Battalions of Detachments had none of these. Although men from the same regiment were grouped in the same company, if their numbers were too small, their company was formed with men from other regiments. 3. The company officers were not necessarily from the soldier's own regiment. In many cases, while the soldiers served under a subaltern from their regiment, the company commanders were not. During the Douro Campaign in the Spring of 1809, the 1st Company of the 1st Battalion was composed of men from the 95th Rifles. The company commander was Lieutenant Thomas Monro of the 42nd Regiment. Daniel Nicol of the 92nd Gordon Highlanders was a bit more fortunate. 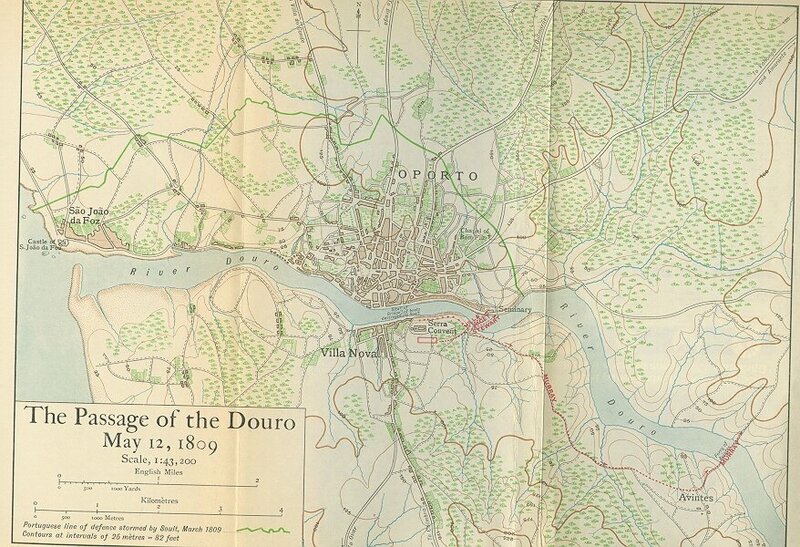 The men in his company during the Douro Campaign were all from his regiment and consisted of "Captain Logie, Lieutenant Cattanach, Lieutenant Durie, Surgeon Beattie, eight sergeants, a piper, and seventy-six rank and file." Yet at Talavera his company was commanded by Captain MacPherson of the 35th Foot. 4. Although the battalions received their share of rations and ammunition, replacement of uniform items and other essentials was a regimental function. The soldiers' regiments were back home and they often went wanting. Lieutenant Wood, wrote that by the end of the Talavera Campaign, he was still wearing the same clothes he left England with two years previously. When he returned to England in 1809 he and his soldiers were ". . . in a most motley and tattered condition. Our coats were patched over with different coloured cloth, for which purpose we had even cut off our skirts. My own coat was mended with the breeches of a dead Frenchman, which I found on the field. . . "
The Battalions of Detachments were formed out necessity and when they were no longer needed, they were disbanded. By late 1813, the British Army in the Peninsula was once again running short of men. In the past, regiments that could not maintain their strength with drafts from home, were returned to the British Isles to recruit and bring themselves up to strength. Wellington was opposed to this practice because it deprived him of many seasoned campaigners. Rather than returning whole units, he began to send only small cadres back. Perphaps based on his experiences with the Battalions of Detachments in 1809, Wellington formed "provisional" battalions from the men not sent back, by combining two regiments into one. During the last year of the Peninsula War, there were three provisional battalions, each formed with four companies from two different regiments, each regiment providing 250 officers and men. These were the 1st Provisional Battalion (2/31st and 2/66th Regiments), the Second Provisional Battalion (2nd and 2/53rd Regiments), and the 3rd Provisional Battalion (2/24th and 2/58th Regiments). Note: Once again I have to thank Ron McGuigan for his valuable help in tracking down obscure sources! His knowledge of the British Army is incredible! Atkinson, C.T. 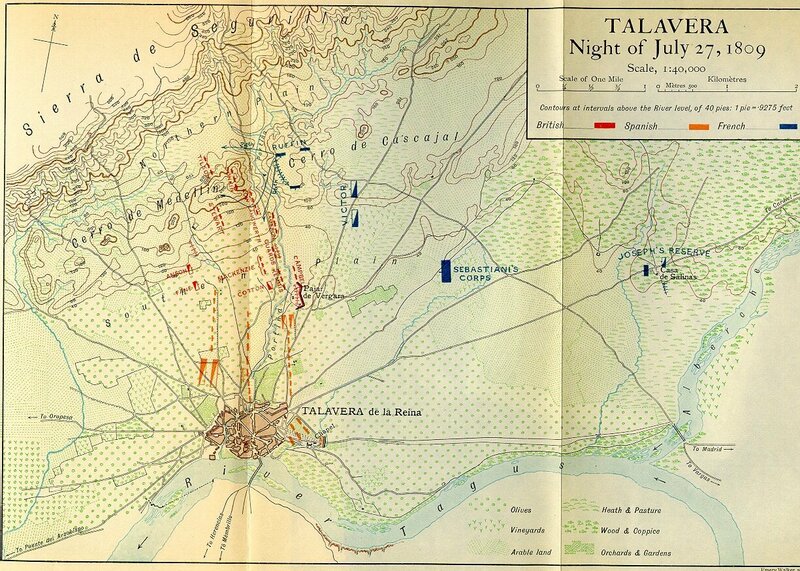 "The Battalions of Detachments at Talavera" Journal of the Society for Army Historical Research Vol. 15; 1936. Fraser, Edward. The Soldiers Whom Wellington Led London : Methuen & Co; 1913. Gibbs, Peter and David Watkins (Editors). "Daniel Nicol's with the First Battalion of Detachments" Spanish Adventures Bridgnorth : First Empire Publishing; 1996. Haythornthwaite, Philip J. "The Battalions of Detachments in 1809" Empires, Eagles, and Lions #69; 15 January 1983. Pages 5 - 7. Haythornthwaite, Philip J. Who Was Who in the Napoleonic Wars London : Arms and Armour; 1998. Morley, Stephen. Memoirs of a Sergeant of the 5th Regiment of Foot Cambridge : Ken Trotman; 1999. Napier, William. History of the War in the Peninsula and in the South of France Vol II; London : Constable; 1995. Oman, Charles. Wellington's Army: 1809-1814 London : Greenhill Books; 1993. Verner, Willoughby. The History and Campaigns of the Rifle Brigade: 1800 - 1813 London : Buckland and Brown; 1995. Wellington, Duke of. General Orders, Portugal,Spain & France 1809-1814 London : T. Egerton; 1810-1815. Wood, George. The Subaltern Officer Cambridge : Ken Trotman; 1986.